Partly cloudy skies. Low 64F. Winds E at 5 to 10 mph.. Partly cloudy skies. Low 64F. Winds E at 5 to 10 mph. 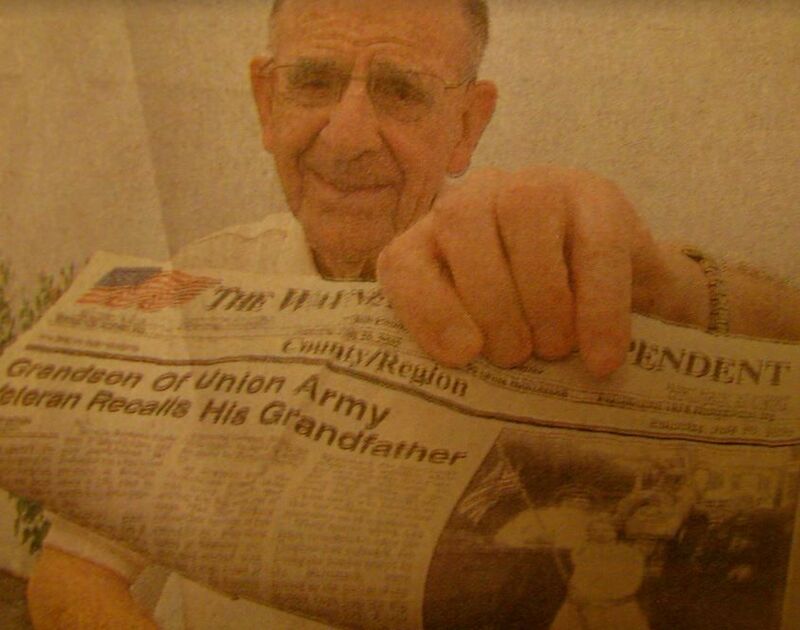 SUN FILE PHOTO Frank Hochstetter, of Englewood, holds a newspaper story showing him and his grandfather Franz Baumann, a Civil War veteran. 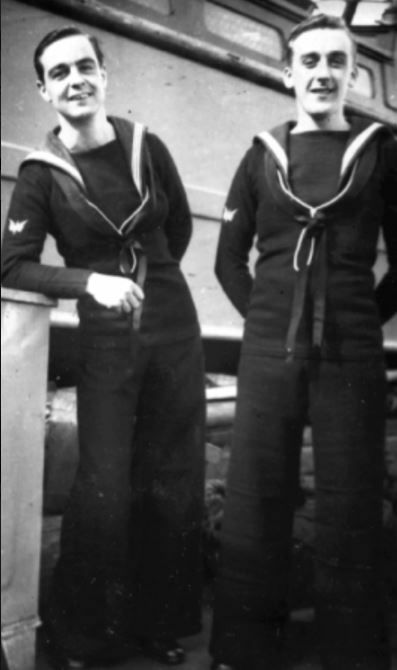 Ken Burns, left, and Stan Goode, were the radar operators aboard the battleship King. Nick Radosevich flew a B-24 Liberator over Europe in the 8th Air Force during World War II. He is pictured with a shadow box containing his two Distingished Flying Crosses, a number of Air Medals, the World War II Victory Medal, aviator’s wings and his 8th Air Force shoulder patch. In the foreground is a map of Nazi-occupied Europe printed in Yank magazine. He is wearing his uniform jacket from World War II. Marcella Zaborac, of Englewood, is pictured as an Army nurse during World War II. She served with the 110 Evacuation Hospital in Europe. Irving Ross, of Punta Gorda, was a member of the 109th Anti-aircraft Battalion in the North African Invasion in 1942. From there he fought on through Italy, France and into Germany as a member of the 72nd Gun Battalion. He was among the first Americans to arrive to the Dachau Concentration Camp. It’s taken years, but I recently completed my 1,000th war story published in the Sun newspapers. That’s stories about local people who served in every branch of the U.S. military all the way back to the American Civil War. Included with these stories are 4,501 pictures — some of the photos are remarkable. “How is that again?” I replied. The grandson of the Union vet proceeded to tell me his granddad was the last surviving member of an Irish regiment from New York City. In the middle of the Civil War, the Irish in New York City rioted because of draft regulations Lincoln imposed. The president brought in federal troops to quell the riot. Not just any troops but soldiers who grew up in the city itself. After the killing of black residents was stopped, the president had the soldiers fall out in Central Park. He shook the hand of each soldier involved in the incident. Since this Union soldier shook Lincoln’s hand and years later shook his grandson’s hand and I shook the grandson’s hand many years after that: I shook the hand that shook the hand of Abraham Lincoln. The date was May 26, 1941. The crippled German Battleship Bismarck was just over the horizon, steaming erratically with two jammed rudders, the result of an earlier attack by ancient fabric-covered British torpedo bombers flying from the deck of the carrier HMS Ark Royal. Leading Seaman Stanley Goode, who lived in Burnt Store Isles, Fla., south of Punta Gorda, could see the ship on his radar scope he was manning aboard the English battleship HMS King George V.
Fleet Admiral Sir John Tovey planned to attack the German dreadnaught come dawn. HMS King George V and HMS Rodney were lying in wait just below the horizon 12 miles away. At 8 p.m. on May 26, 1941, Goode spotted the Bismarck on his radar scope. At sunrise, they would attack. The Bismarck slid beneath the waves at 10:40 a.m. after a two-hour barrage. Only a couple of hundred of the ship’s 2,000-man crew were rescued. When HMS King George V sailed into Scape Flow, in the north of Scotland, right afterward, Goode was aboard the battleship. He recalled they got a big welcome. Whistles sounded because of their historic victory. They had won one of the major sea battles of World War II. Nick Radosevich of Englewood was taught to fly a B-24 Bomber in World War II by Jimmy Stewart. The movie star must have done a good job, because Radosevich flew 32 combat missions over Nazi-occupied Europe with the 8th Air Force. “I flew with him as a test pilot 10 or 11 times, about 100 hours. He was a super pilot and always very cautious,” he recalled. “Lucky Penny” was the nickname given his bomber. They flew out of south Florida headed for North Africa on Christmas Eve 1943. “In the first few days we flew almost a dozen combat missions over Germany. On our eighth mission, we bombed munition plants in southern Germany, along the Swiss border. We lost our No. 3 and 4 engines over the target,” he said. “‘We couldn’t keep up with our bomber formation. “I asked the crew, ‘Do you want me to try and fly the plane back to England or do you want to make an emergency landing in Switzerland where we would be interned for the rest of the war? ‘Take us back to England,’ they said. “OK, hang on because we’re going down on the deck. I flew 200 feet off the ground, trying to avoid enemy radar, as we hedge-hopped across Germany and occupied France,” Radosevich said. “We made it across the English Channel and landed at the first base we came to. It was a Royal Air Force fighter base. A couple of days later our two destroyed engines were replaced and we flew on to our home base. First Lt. Marcella Zaborac of Englewood came ashore on Normandy beach August 1944 with Gen. George Patton. She served as a nurse with the 110th Evacuation Hospital in the general’s 3rd Amy that fought its way across France and into Germany during World War II. “When we started across France with Gen. Patton, the rainy season had started. By the time we reached Luxembourg, it was raining most every day. There was mud, mud, mud everywhere,” she said. “When the ‘Battle of the Bulge’ began in mid-December at Bastogne, Belgium about 50 miles away, we were the only American hospital in the area,” she said. “We got all the patients from the Bulge. “These young soldiers were coming into our hospital in terrible shape. We did what we could for them and if they were transferable we sent them on to a general hospital further behind the lines. If they weren’t, we kept ’em and nurse them until they were,” Zaborac said. “Conditions at our hospital in Esch al Vet started getting out of hand when we became overloaded with patients around the 20th of December. From then until New Year’s it was work day and night,” she said. “I remember working 24-hour shifts for a short time during the ‘Battle of the Bulge’ until we got more medical help in the hospital. “Thank God I was 24. I would have never made it,” she said. He was among the first American soldiers to help liberate the Dachau concentration camp in Germany near the close of World War II. His 109th Anti-Aircraft Battalion, part of the 72nd Battalion together with the 45th Infantry Division, walked into the massive death camp without a fight. The Jewish sergeant from Rockaway Beach Long Island couldn’t believe what he saw. Prisoners in the camp were chanting: “Americans, Americans, Americans” as they walked into the barbed war enclosure. “There were thousands of bodies stacked up waiting for the furnace,” he said. “It was beyond imagination, the enormity of it all. The living were sitting around on the ground eating raw potato peels between dead bodies. It was awful. Toward the end of his tenure at Dachau, Ross spent much of his time escorting dignitaries and reporters from the word press through the camp. “I showed them the ovens where they burned the bodies. There were three or four ovens, and the ashes from the creations sifted down into the basement underneath,” he explained. Visit www.donmooreswartales.com for more than 900 stories of veterans who grew up or moved to Southwest Florida.